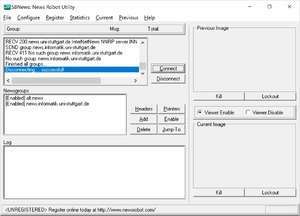 SBNews / News Robot: Binary Newsgroup Auto-Downloader w/ yEnc support. Automatically download and decode attachments from binary newsgroups. Works with all types of attachments including jpeg/gif/bmp images, mp3/wav audio files, Windows AVI (*.avi)/mpg movies, archive files, and much more. SBNews 10.3 is a shareware program and can be used as a demo to try the software until the free trial period has ended. A full version of the program is available after the trial period ends. For security reasons, you should also check out the SBNews download at LO4D.com which includes virus and malware tests. Additional screenshots of this application download may be available, too.